Boy declares Dragon’s Tooth “Best Hike Ever.” Mom agrees. Yesterday was our eight year old son’s special day*, where he got to pick a meal and a family activity for the day. Knowing his tendency towards lounging all day in PJs, I bribed him. I told him, “If you pick an active family activity, like, I dunno, hiking Dragon’s Tooth, I’ll make cinnamon rolls for breakfast.” Lucky for us, his sweet tooth pulls more weight than his lazy bones. We’ve taken our kids on several hikes around Blacksburg, and they always love the first third of the trail. Then it all looks the same to them, and the boredom sets in, and they begin asking for snacks, telling us their legs hurt, wondering, “Are we almost at the top? Are we almost done?” Neither of us care about pushing our kids to be any certain way except the way that they are – we won’t push them to be scientists just because their dad is, or pastry chefs just because I like donuts and cupcakes and croissants – but we really, really, really do hope that they will enjoy and appreciate the outdoors. So we try to make it fun for them, taking them to waterfalls, pointing out cool spider webs, oohing and ahhing over golden leaves, showing them boulders they can climb. Playing 20 questions if it comes to that. And most importantly, finding new trails that will keep them excited about the woods. When I hiked Dragons’ Tooth with two girl friends a couple of weeks ago, a 2.4 mile trail (4.8 round trip) that involves nearly a mile of scrabbling over rocks, I knew the kids would love it. Their most recent hike was a really steep 2.3 mile hike (Angel’s Rest) with great views at the top and a beautiful trail to boot, but after a demanding 4.6 mile round trip, I think they were done with hiking for a while. We knew we had to pull out the big guns to get them excited again, so I showed our son photographs from the Dragon’s Tooth. Pictures of metal ladder rungs bolted into rocks, shots of sheer rock faces with the white blazes of the Appalachian Trail painted on them, photos of trail that was nothing but jagged ledges of stone. And the prize at the end of the hike? 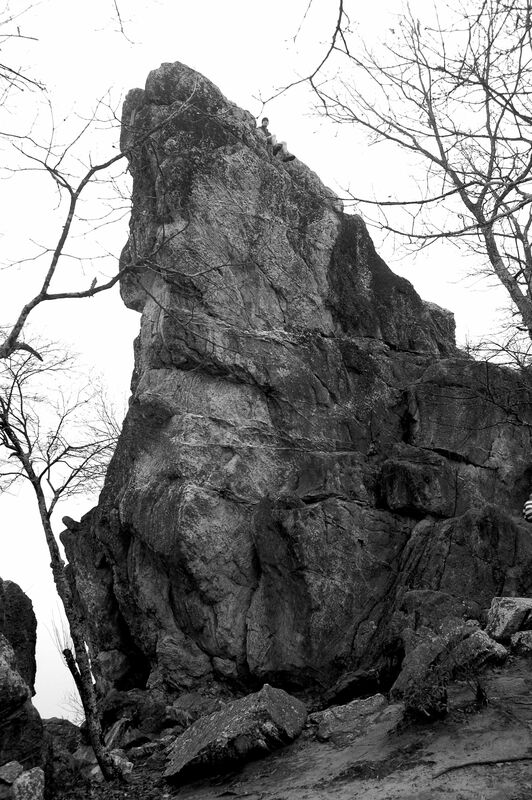 The Dragon’s Tooth itself – a massive sheet of rock, jutting 35 feet out of the ground like an ancient snarled tooth. That, and trail mix with M&Ms. The best part for me, though, was not just how much the kids loved the rocks (though that helped). It was the conversation. The morning was grey and raw, we had the trail to ourselves, and everything looked different than our normal hikes – more mysterious because of the mist and the dampness. On our way up, I pointed out some pink leaves that were still hanging on – papery ovals quivering in the deserted forest, ready to fall at any moment – and our son observed them, trying to pinpoint their exact color, when he finally proclaimed that they were peach. Not the darker orange color of peach flesh, but the delicate pinkish orange of their skin. He was specific about this. When I exclaimed over lichens, plump and green like I had never seen them before – they were the same shape as the dessicated lichen discs we often see, and I wondered if they were those same black lichens, only hydrated – our daughter said, “They look like those noodles I like – the ones stuffed with chicken and cheese? Ravioli! They look like green ravioli.” And indeed, that was exactly what they looked like. I jotted this down for a future haiku. On our descent, after both kids had climbed partway up the Dragon’s Tooth (our daughter wanted to climb higher, our son said he would never climb the tooth itself again – getting down off of it was too “freaky”) and after the four of us had eaten nearly two pounds of trail mix, the kids were subdued. They loved the rocky parts on the descent, but they were quieter as they scaled them. Once we were back down to the regular old hiking trail, we feared the tiredness and boredom would set in. Meanwhile, our son explored a hole in a tree, sticking his head inside to see what he could see. And then we talked about chipmunk farts and what they probably sound like (a short pffft or bzzt, according to Dad). We talked about a bear’s fart after hibernation, and how godawful it would smell after being held in for three months. To which our son replied, “I fart in my sleep, why wouldn’t a bear?” Yes, this is true. We talked about bird farts, and how we can’t smell them because they’d be even tinier than chipmunk farts, and besides, birds are dainty and would fart high in the sky, where nobody would ever know. And then she told me about the life cycle of a plant, all the while warming my big hand with her little one, impressing me with her first grade knowledge of botany. I thought I’d stump her when I asked what part of a plant a pine needle might be, but after thinking about it a minute, she answered “I think it’s a leaf because it comes off of the stem.” Right-o, Smart Tart. We ambled our way back to the parking lot, glad we had hit the trail early, because now the lot was full. I smiled to myself. After hearing our son say somewhere along the way, “I love those peach leaves, and the little baby pine trees, and the ravioli on the rocks. Basically, I just love all the things that nature makes,” I had to agree with him that Dragon’s Tooth was the Best Hike Ever. *We instituted Special Days last year after feeling bad for dragging the kids around on errands, or feeling like we could never all agree on what to do on a Saturday afternoon. So now, we rotate. Each weekend, one of us gets a special day. On a person’s special day, in addition to getting to choose the brunch menu, a special dinner, or a dessert on their day, the special person also gets to choose a family activity. This motivates my husband and me to set aside a chore-free, errand-free time for the four of us to hang out, and it has been a huge hit with the kids. They’ve had a lot of fun trying new foods, going to the antique car show for Dad, going to the conservatory for me, and especially, not having to go to Home Depot or the shoe store when it’s their turn to be special. I highly recommend it. What a wonderful family outing! I’m so glad you enjoyed it and now have some treasured memories of that special day! This was awesome! And I have to tell you, I really love your “special day” idea, Andrea! What a wonderful way to empower and validate each person in the family. I love how that teaches the kids to be patient and giving with their time and energy. I might have to steal this. 😉 Carry on. Yes, patience has been one of the greatest lessons of this special day thing. That and not complaining. The only rule for the special day is that nobody is allowed to complain about the special person’s choices :-D. I’m sure your boys (and you and Hap) would love it – it really does empower and validate each person. I love that you phrased it that way – that’s a perfect way to put it! Wonderful post, as usual! I love the idea of special days…I think we’ll have to institute that around here (along with more hiking)! Great post! I think I might (re)introduce special activity days for my family, too, though with all the weekend commitments ( My children are older) they would have to be less frequent. I must confess, though, I would never have made it to the top of The Tooth. I love all the things nature makes, too! Even partway up the tooth was terrifying – I had vertigo even from the middle. There’s no way I’d ever go to the top! You have such great ideas, you make me want to have kids to try them! Love the idea of special days. We do something similar.